In this ground-breaking book Danah Zohar lays the foundation for a science of consciousness. She eschews the lugubrious saga of Schrödinger's Cat for the tantalizing tale of the "Cosmic Hussy." 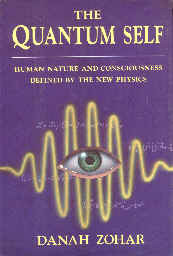 Richard Feynman won a Nobel Prize for showing how all of Quantum Electro-Dynamics can be derived by the simple expediency of considering all the possible paths that an electron may take from point A to point B. Zohar considers all the possible paths that a young girl might take from virginity to married bliss. Her Cosmic Hussy selects, simultaneously, all of her possible suitors and lives out her life with each one, marrying, having children and grandchildren, before deciding which man she chooses to collapse her quantum wave function upon at the altar. Having settled down with one suitor, she will have left traces of her many trials (virtual transitions, in quantum terms) all over the globe in the form of possible children, former residences, etc. As David Bohm says, "... For a great many physical processes are the result of these so-called virtual transitions." Evidence was found by Herbert Fröhlich in England of the existence of condensed phase states in living tissue similar to those referred to as Bose-Einstein condensed phase states. Previous to his discovery these were thought to exist only in superfluids and superconductors -- at very low temperatures. These correlated phase states in our cellular structures, Zohar suggests provide the physical basis for the phenomena we know as consciousness. Like a celestial choir of a myriad of voices (each voice a cellular molecule) - we have consciousness. Our very thought exists as the chords sung by this multitudinous choral array. Instead of a motley conglomeration of tissue, heart, lungs, kidneys, etc., we, by virtue of this harmonious ensemble, become one, an 'I'. Since the low level microwave radiation that collapses into the condensed phase of consciousness does not stop at the skin, our consciousness inter-relates with other living and perhaps non-living matter in the universe. Thus we all become Cosmic Hussies as we interact with the world of probabilities and virtual transitions required by the laws of quantum reality. One of the consequences of the Bose-Einstein condensate model is that the unity of consciousness will be affected by the amount of energy pumped into a system. When more energy is pumped into an individual by the focused attention of others, we would expect the unity of consciousness (and therefore its clarity) to be increased. This is almost an exact statement of one of James Redfield's insights in the Celestine Prophecy. Zohar's book provides extensive an physical basis for most of Redfield's Celestine insights. This book is loaded with insights and it demands a close reading by anyone interested in understanding the nature of consciousness, life, and death. Zohar's speculation on quantum immortality alone is worth the price of the book. How quantum reality generates free will and creativity in the individual is a true gift to all who survive to the "Creative Self" chapter. Near the end of the book Zohar brings us to understand that ". . . mind is relationship and matter is that which it relates. Neither, on its own, could evolve or express anything; together they give us ourselves and the world." Together, via the Bose-Einstein condensed phase which is Danah Zohar, mind and matter have given us a view of our ultimate reality -- a vision of ourselves as co-creators of the universe we find ourselves ensconced within.